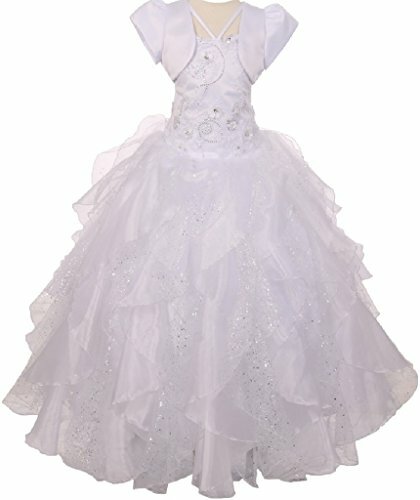 Beautiful First Communion dress for your girl. Featuring a sequin and flower embellished bodice and a halter neckline, this dress is surely going to make her feel special. The multi layered organza and sparkly tulle skirt gives the extravagant look of the dress. Zipper closure and corset on the back to adjust for size. Matching plain satin bolero included. Made in USA. Featuring a sequin and flower embellished bodice and a halter neckline, this dress is surely going to make her feel special. The multi layered organza and sparkly tulle skirt gives the extravagant look of the dress. Zipper closure and corset on the back to adjust for size. Matching plain satin bolero included. Made in USA. If you have any questions about this product by Dreamer P, contact us by completing and submitting the form below. If you are looking for a specif part number, please include it with your message.